Q From Barton Brown: I have searched the Web to the best of my ability to find an explanation of the derivation of the phrase plucking the gowans fine, which P G Wodehouse employed many times in his writings. It seems to express the nostalgic recollection of “a good time being had by all”, and the possibility of renewing those good times among long-parted friends. Its etymology seems — online, at least — to be a closed book. Can you shed any light on this curious phrase? It was many years since this Cheesewright and I had started what I believe is known as plucking the gowans fine, and there had been a time when we had plucked them rather assiduously. Joy in the Morning, by P G Wodehouse, 1947. Auld Lang Syne, by Robert Burns, 1788. The title roughly translates as “times long past”. “Twa” means two; “hae” means have; a “brae” is a hillside; “mony” means many; “sin’” is short for since. The line needs some translation. 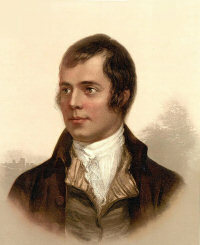 Pu’d is the past tense of the Scots verb pou (sometimes written as pu in Burns’s time). This may be translated as “pull”, but it has a rather wider compass. It covers the actions of plucking flowers (or chickens), gathering fruit, or harvesting or collecting produce of any kind. A gowan with a supporting adjective may be a wild flower of several sorts, but standing alone it’s the common daisy. Pu’d the gowans fine may therefore be rendered in modern English less obscurely but also less romantically as “picked the fine daisies”. As you suggest, the line does evoke carefree former times, as Wodehouse meant by it. There’s no mystery why he chose plucked, which is a perfectly good equivalent of the Scots verb and is both more powerful and evocative than picked. Perhaps the greater mystery is why nobody else seems to have done so. Last modified: 8 May 2010.